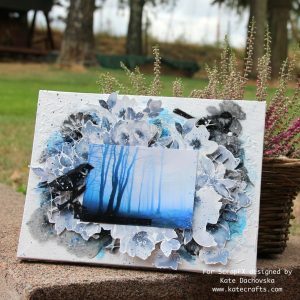 I would like to share with you really colorful canvas, I stepped outside far far away from my confort zone and I tried to make something little bit crazy. 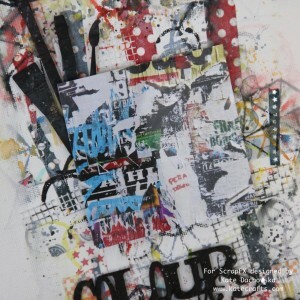 But why not craziness in art can be great relax. How to: Cover whole canvas with white gesso, through any ScrapFX stencil apply any kind of structure paste, dry after each step. 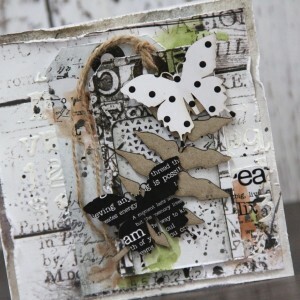 Take different washi tapes and glue it here and there and lightly cover them with gesso. 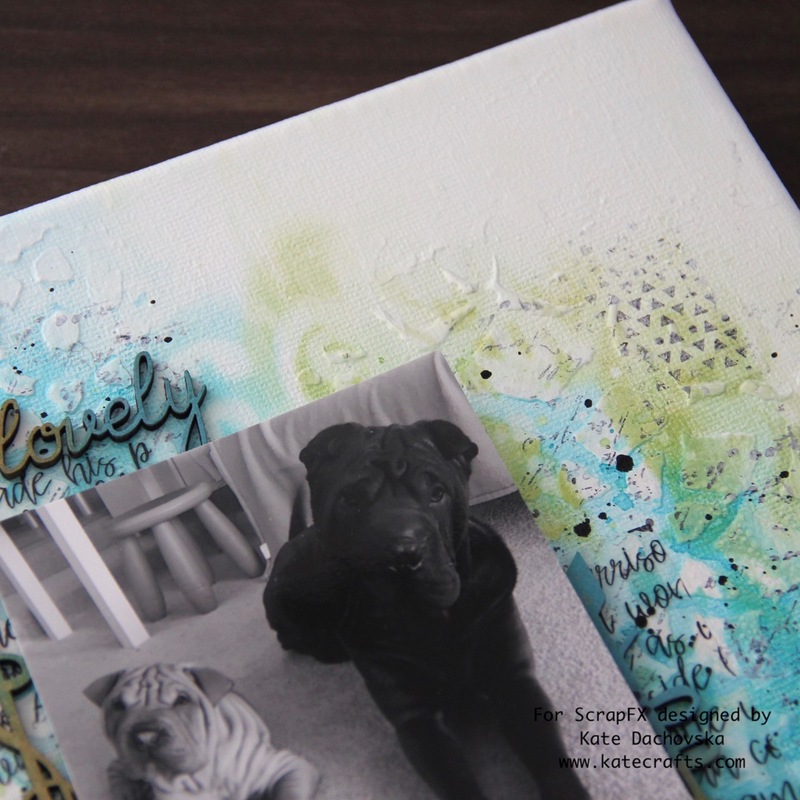 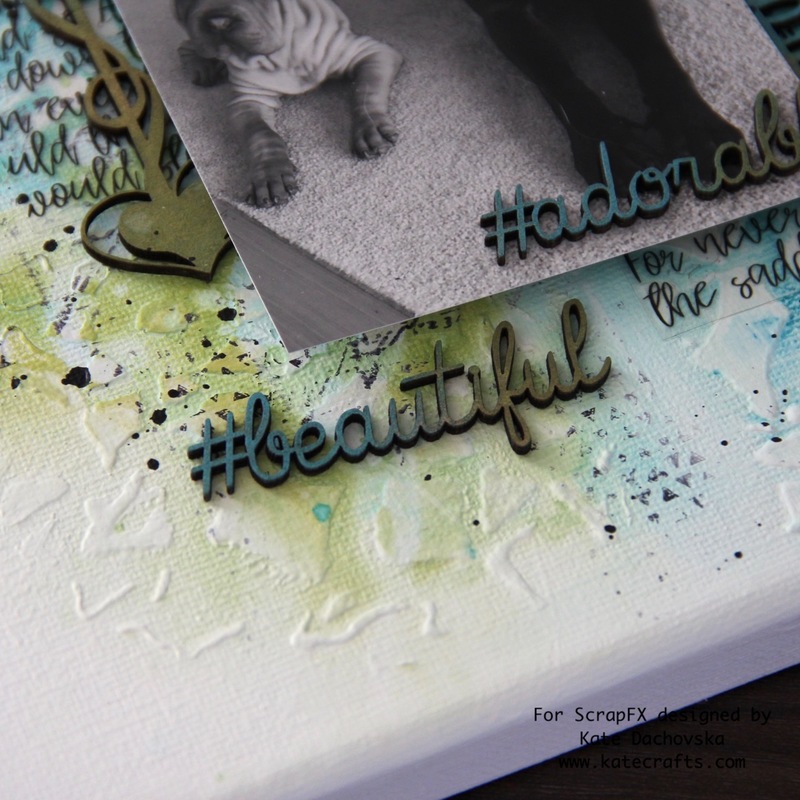 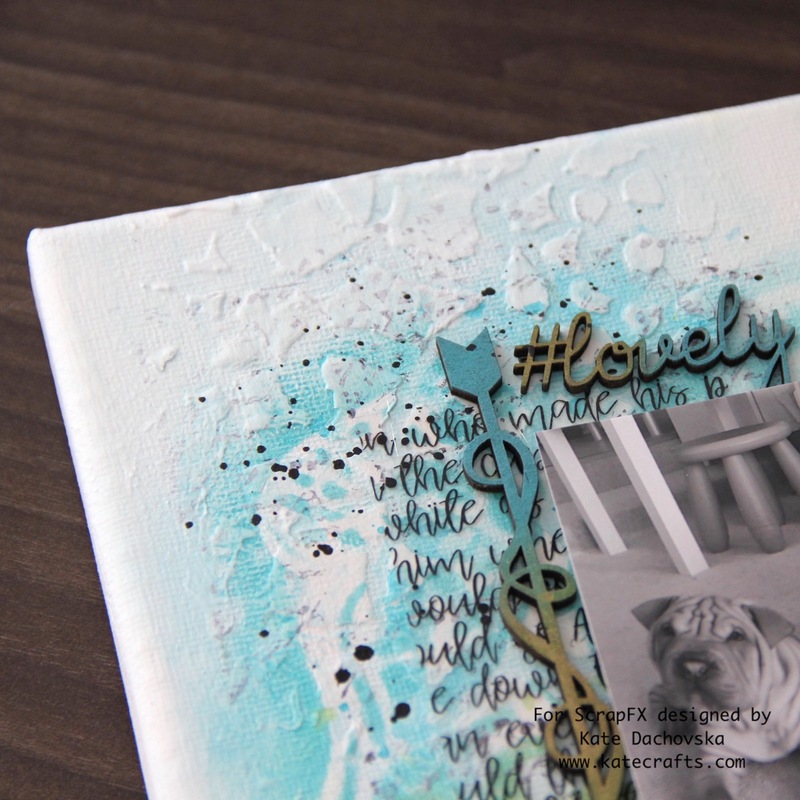 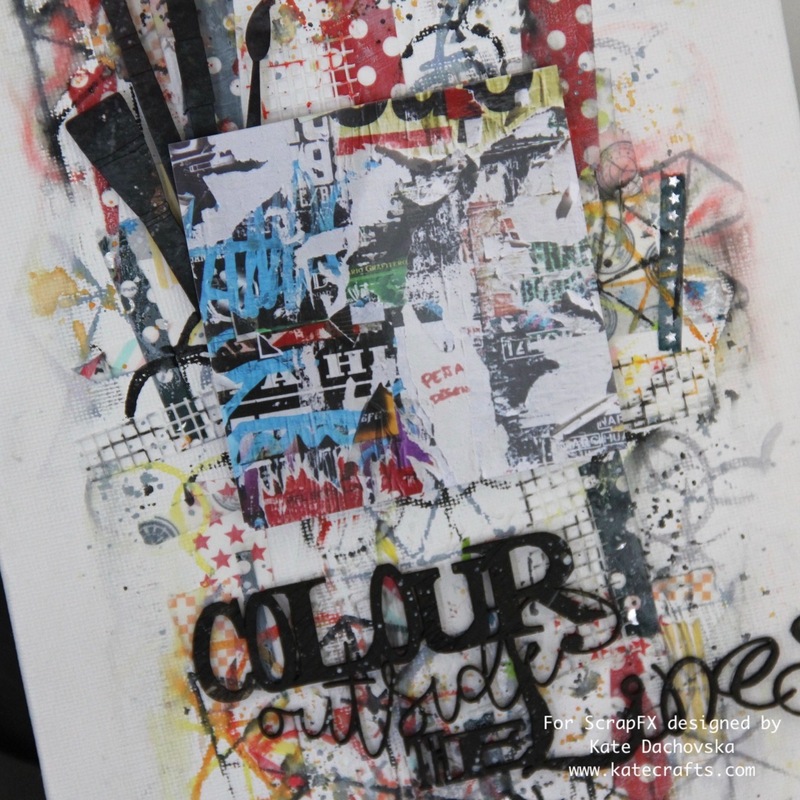 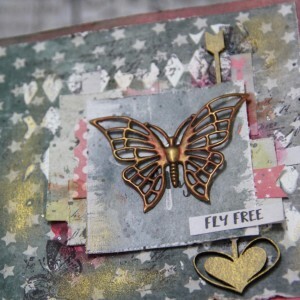 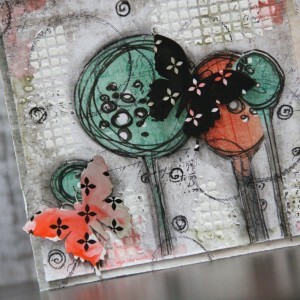 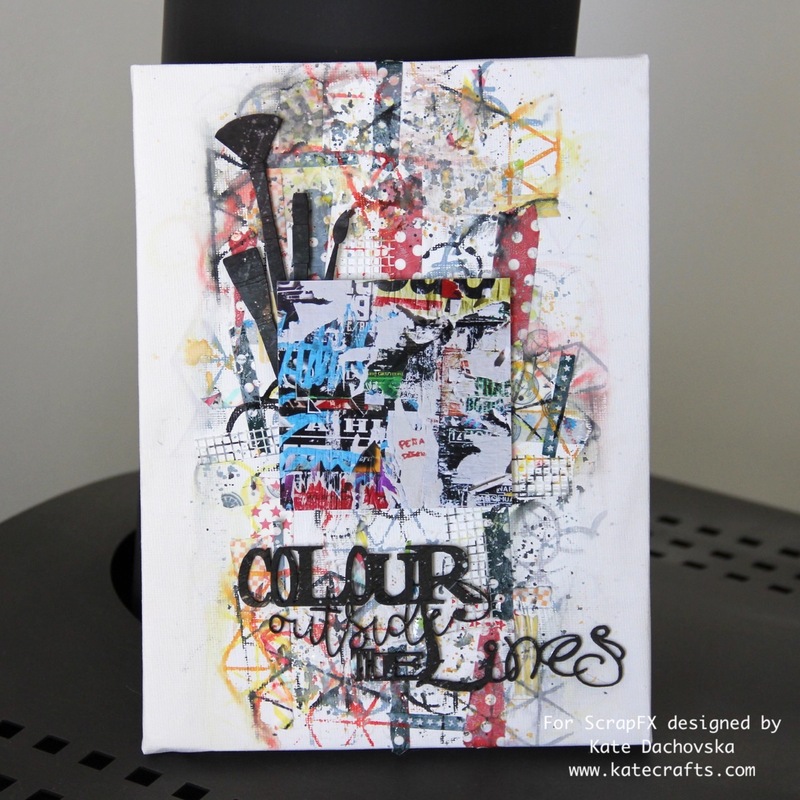 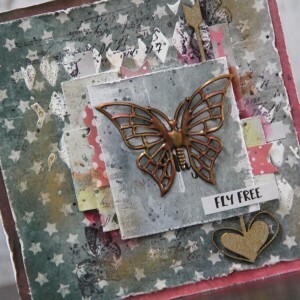 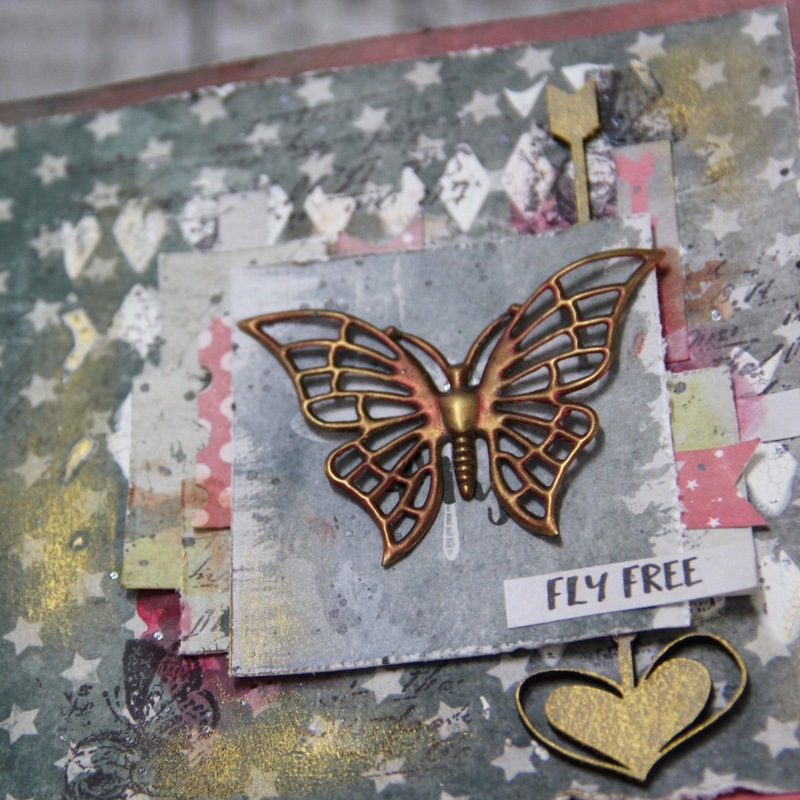 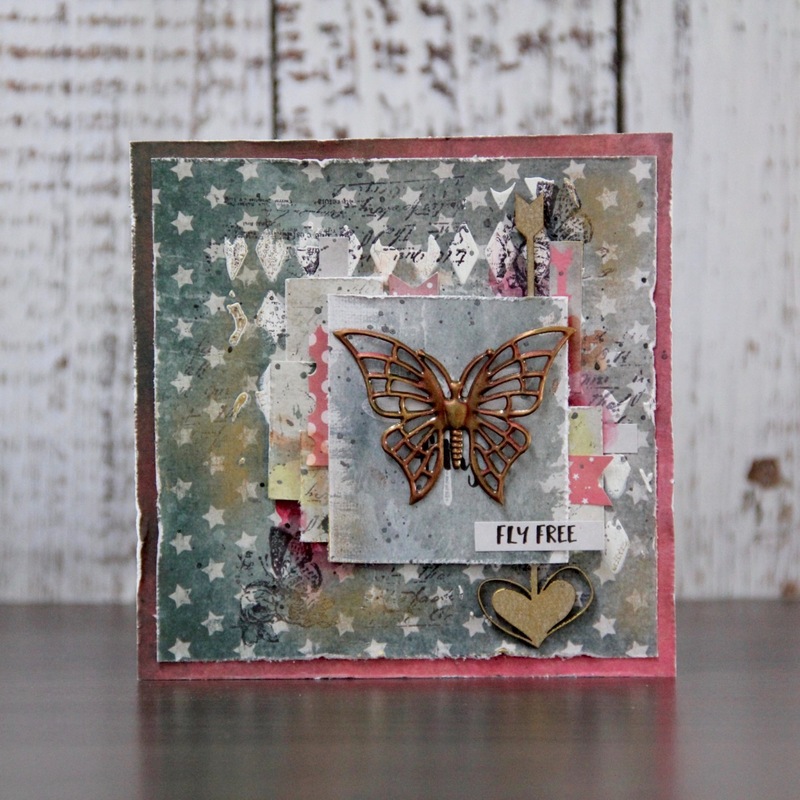 Take ScrapFX stamps and different Distress oxide inks and stamp all over canvas, just let borders white. 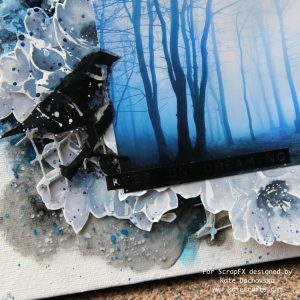 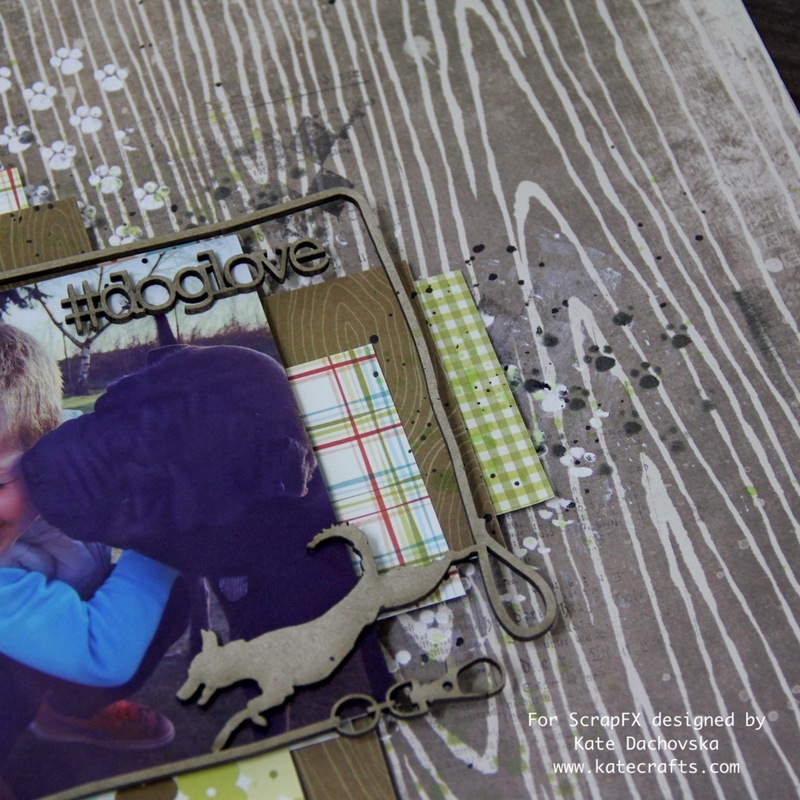 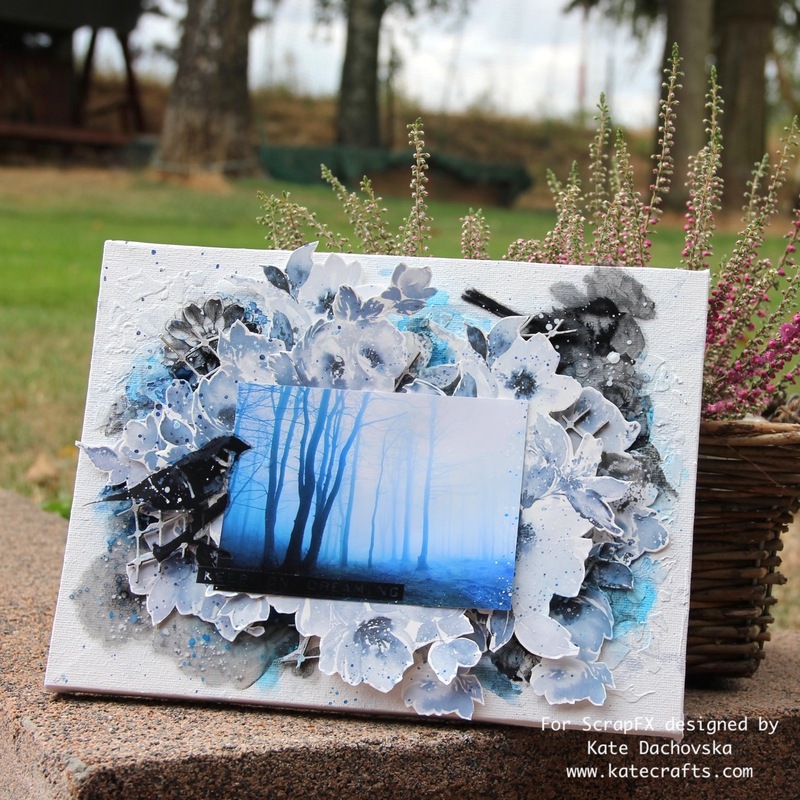 Glue main photo, colour chipboards, glue them and make tons of splatters. 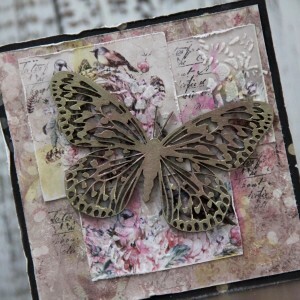 This entry was posted in Scrap FX and tagged canvas, mixed media, Scrap FX. I would like to share with you more projects. One canvas, two cards and one bookmark. 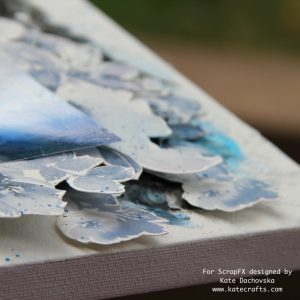 Canvas is very simple I used big washi tape from Altenew I glued it on card stock and cut different flowers. 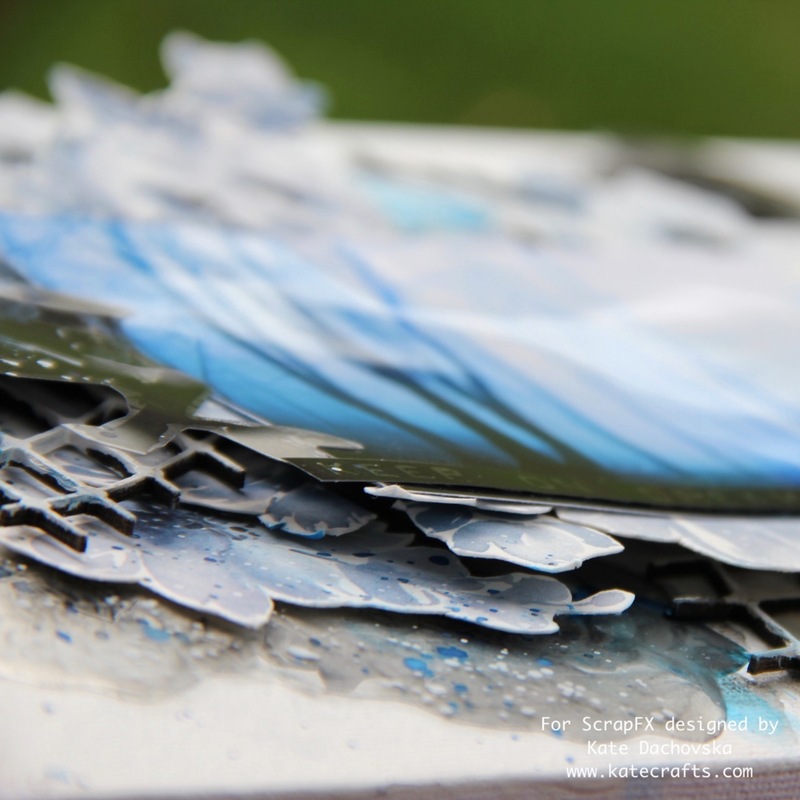 I cut also different motives from awesome transparencies. 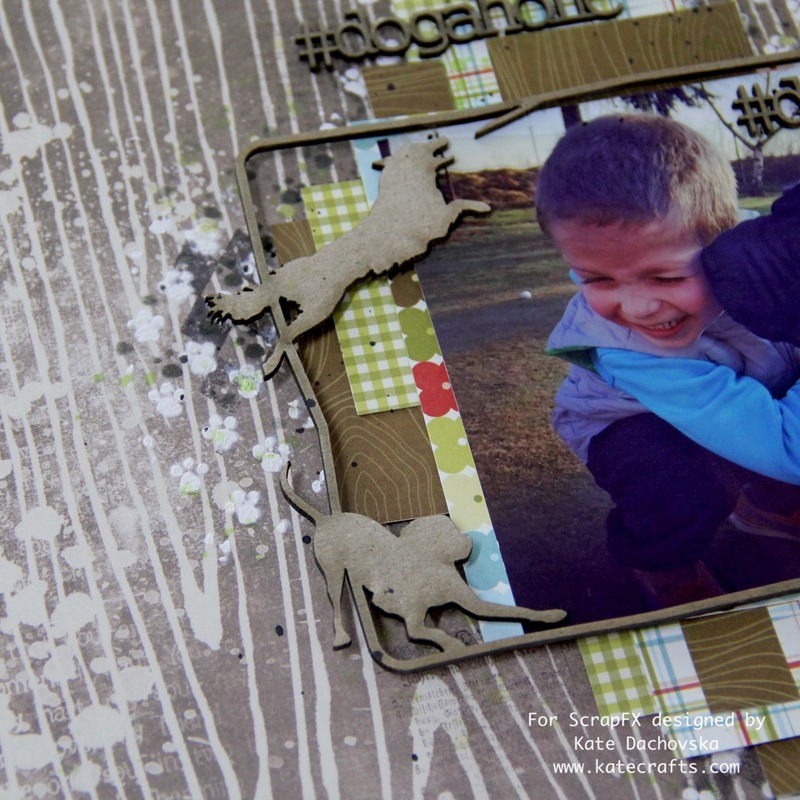 And I layered everything behind photo. All colours are watercolours and white acrylic paint. 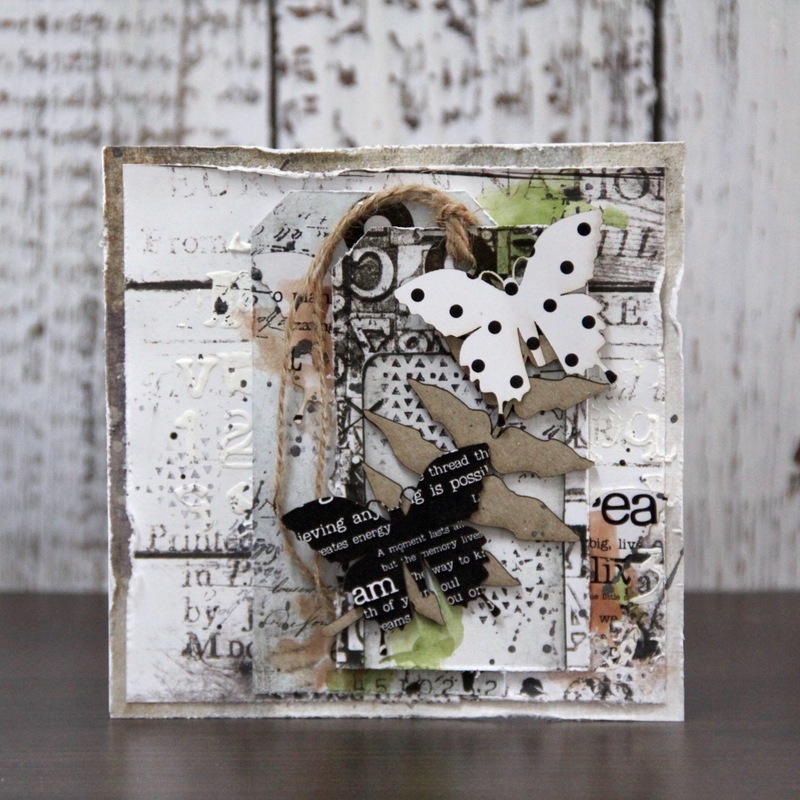 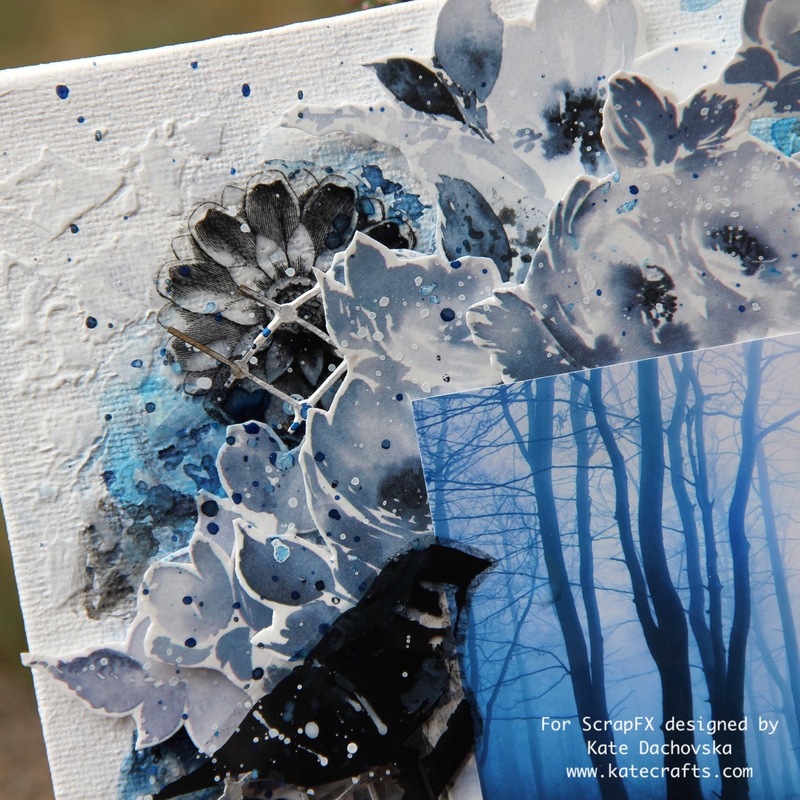 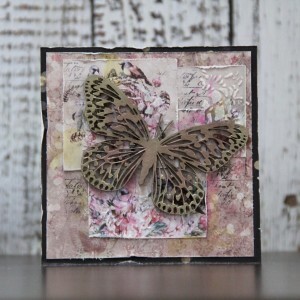 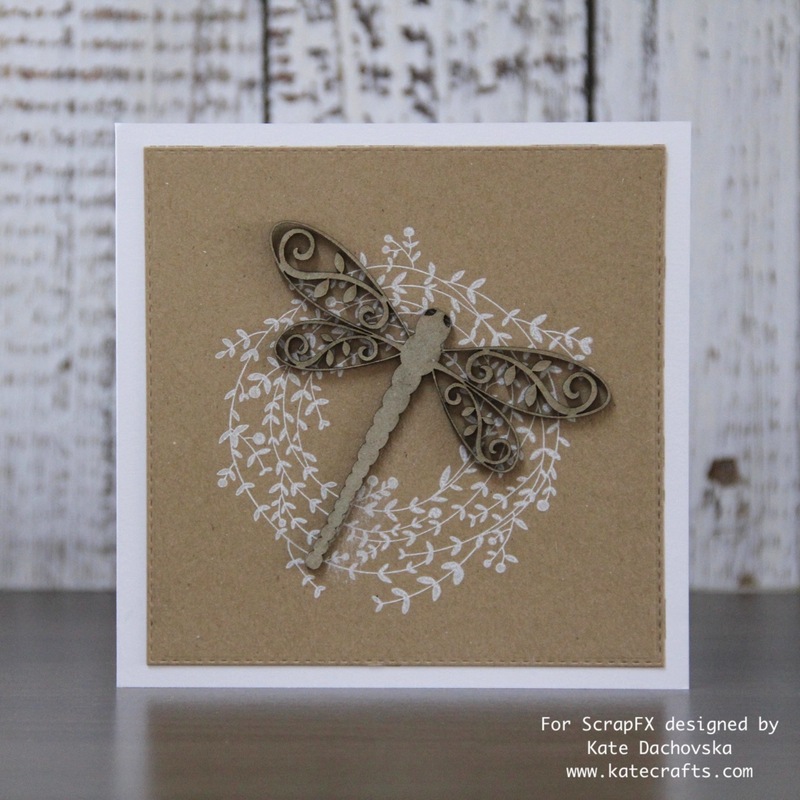 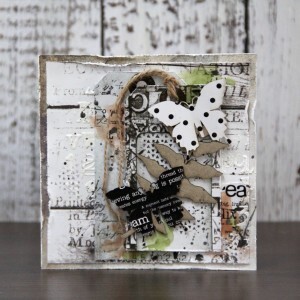 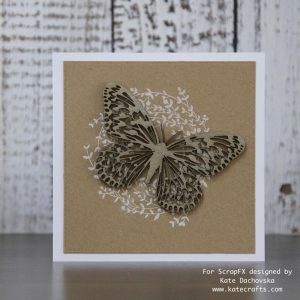 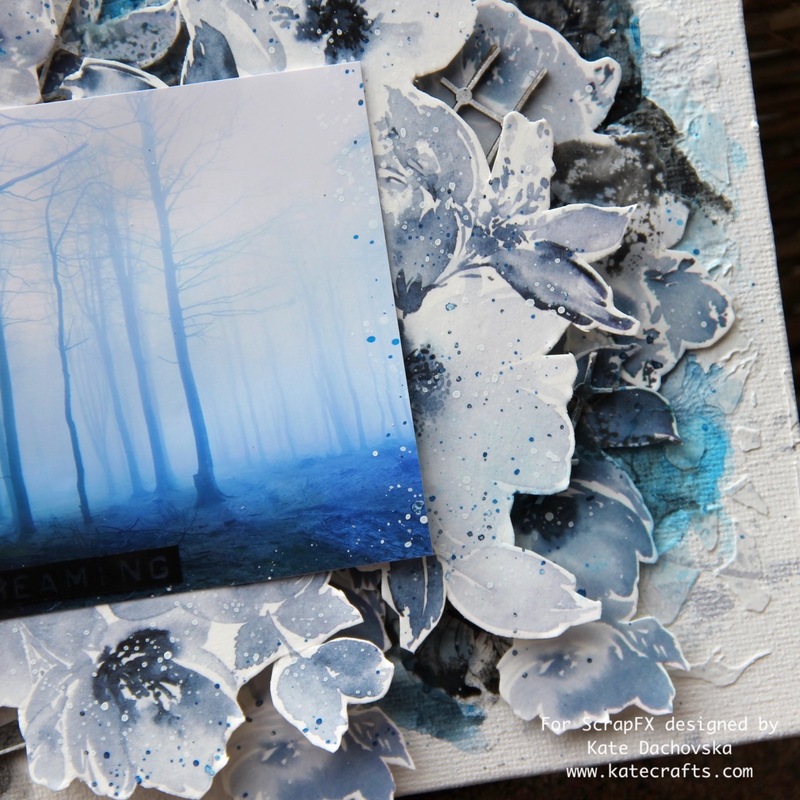 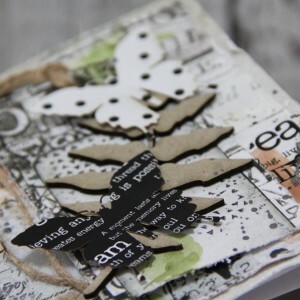 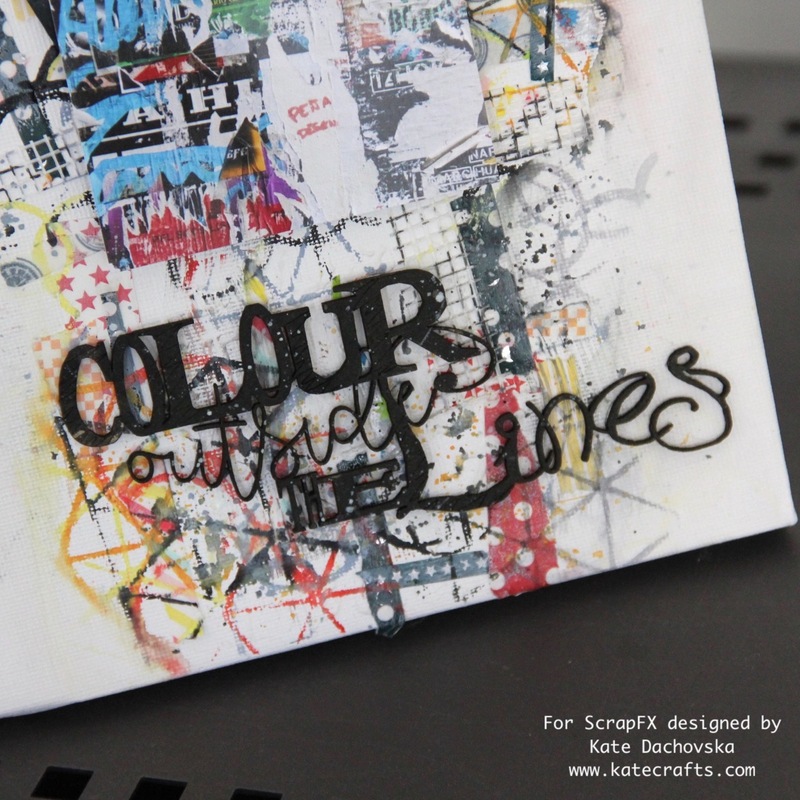 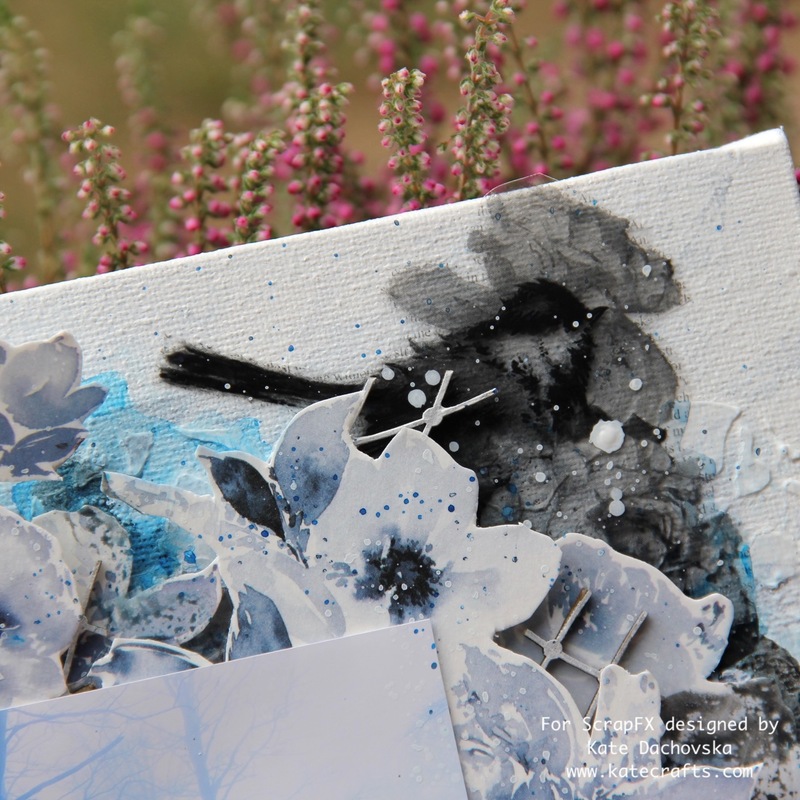 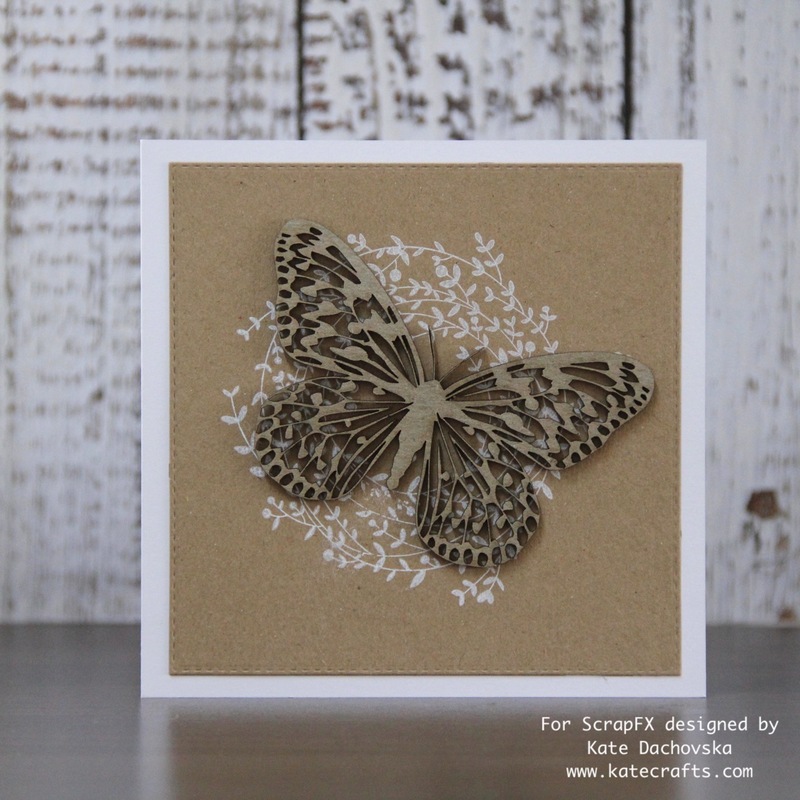 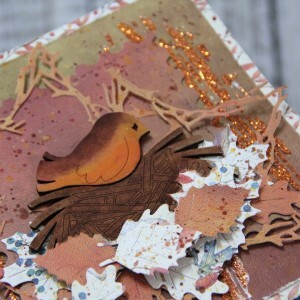 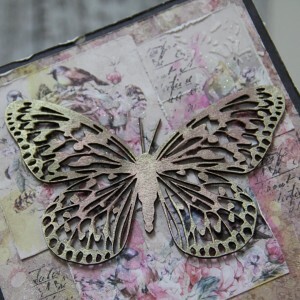 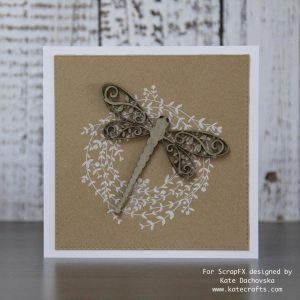 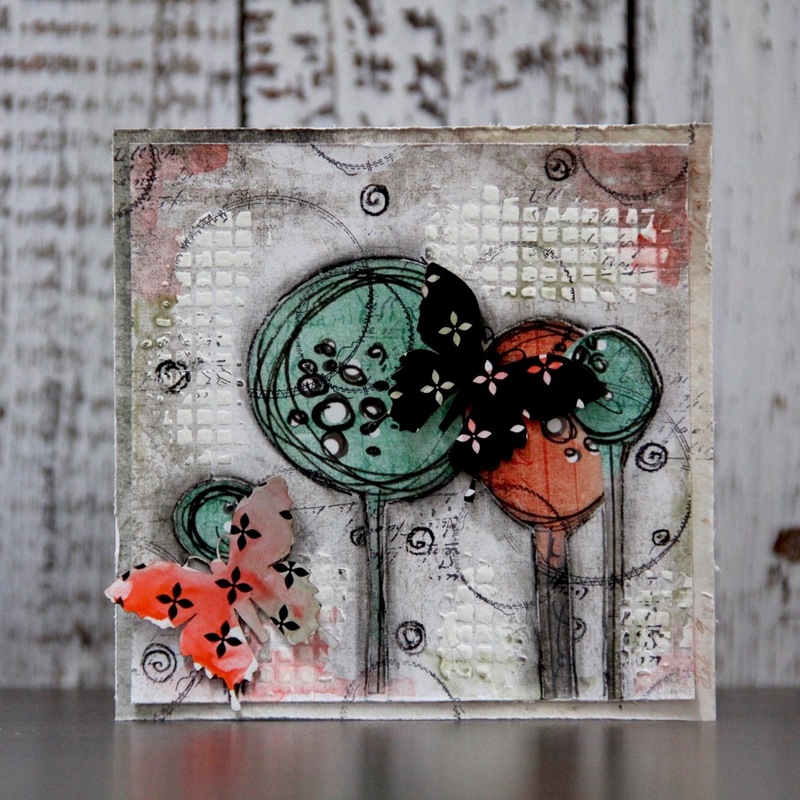 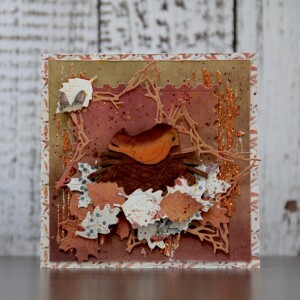 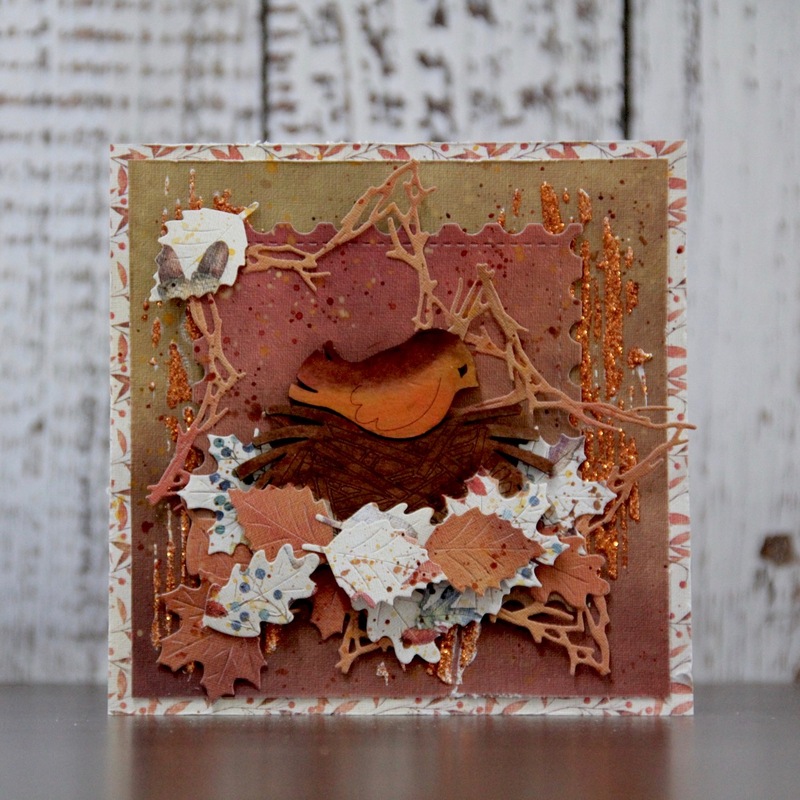 Cards are made just with one stamp, white ink and lovely chipboards. 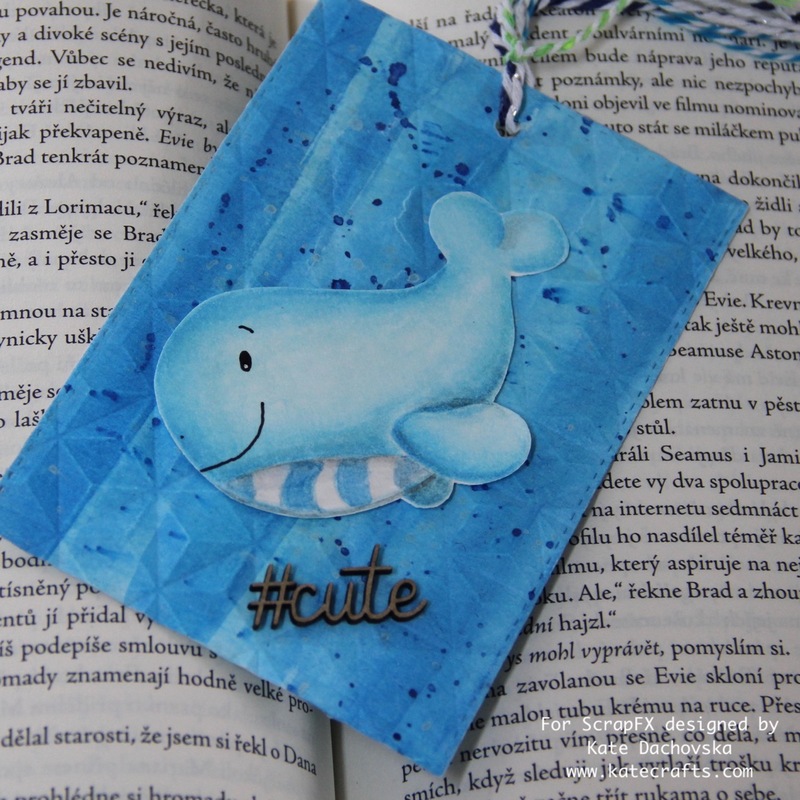 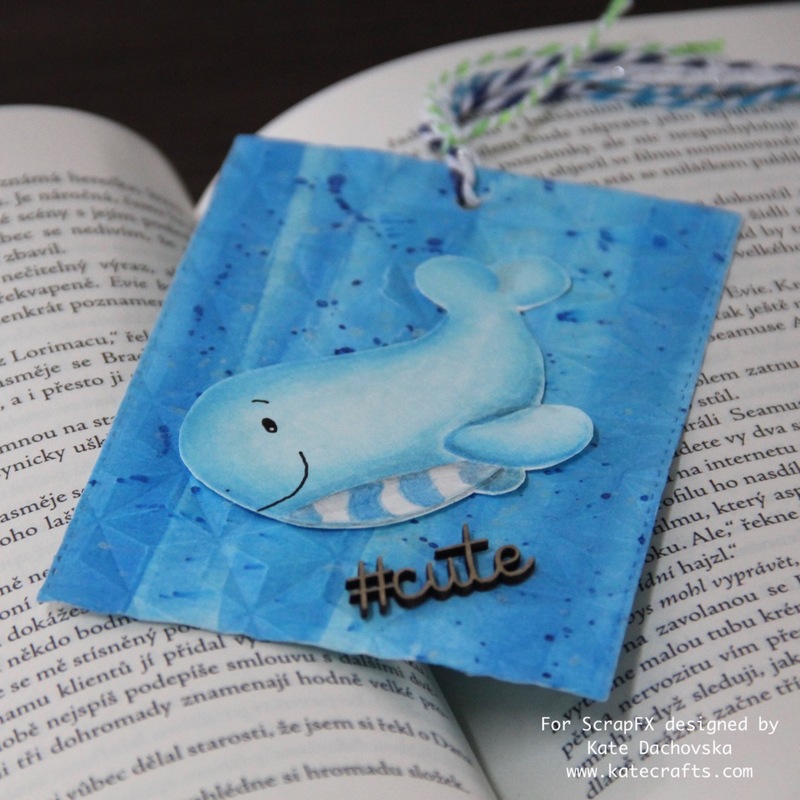 For bookmark I painted whale with watercolours and with the same watercolours I made background. 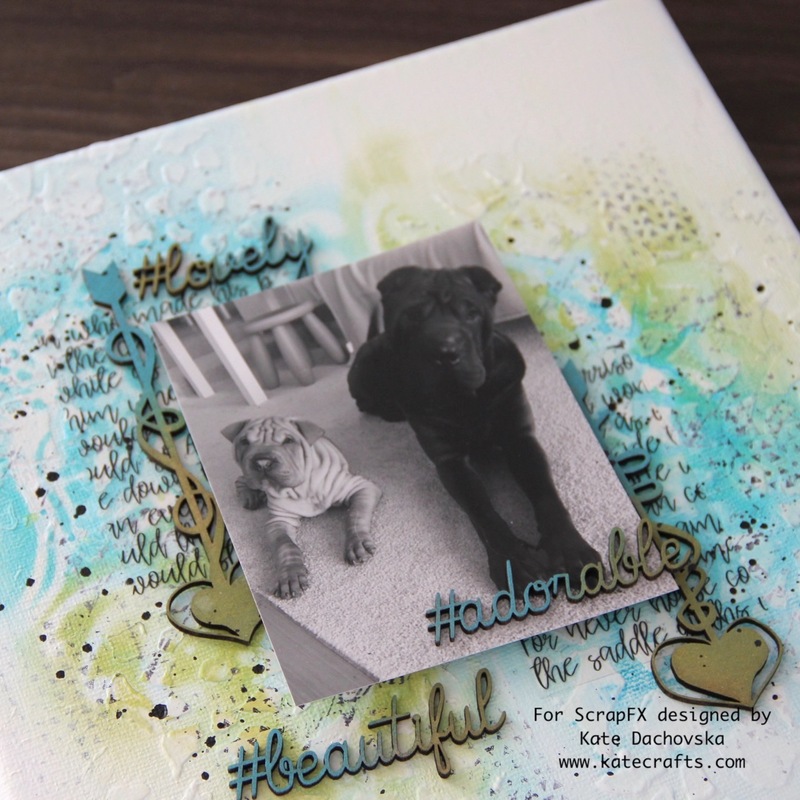 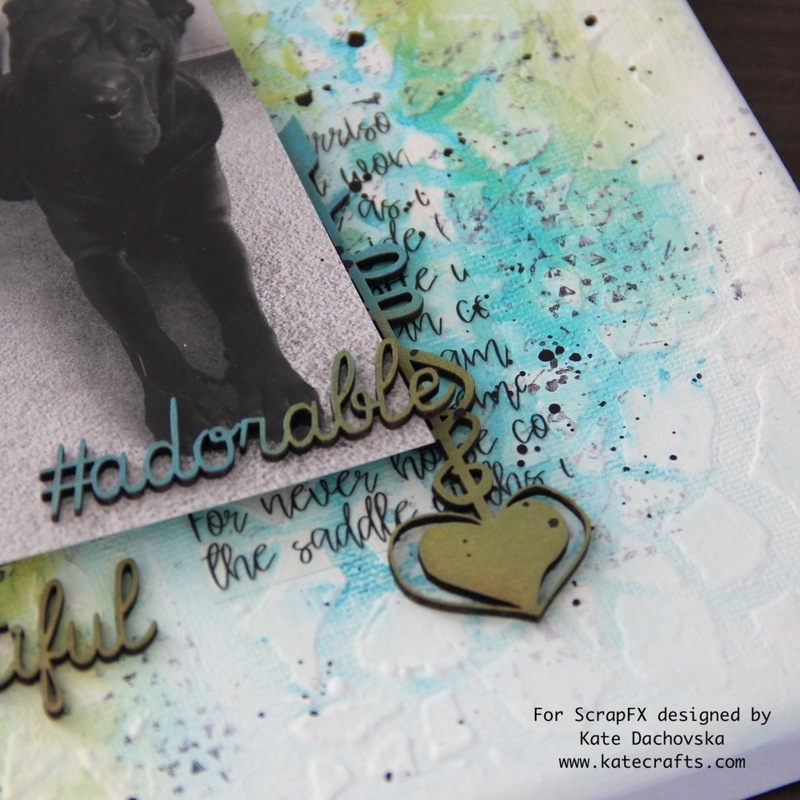 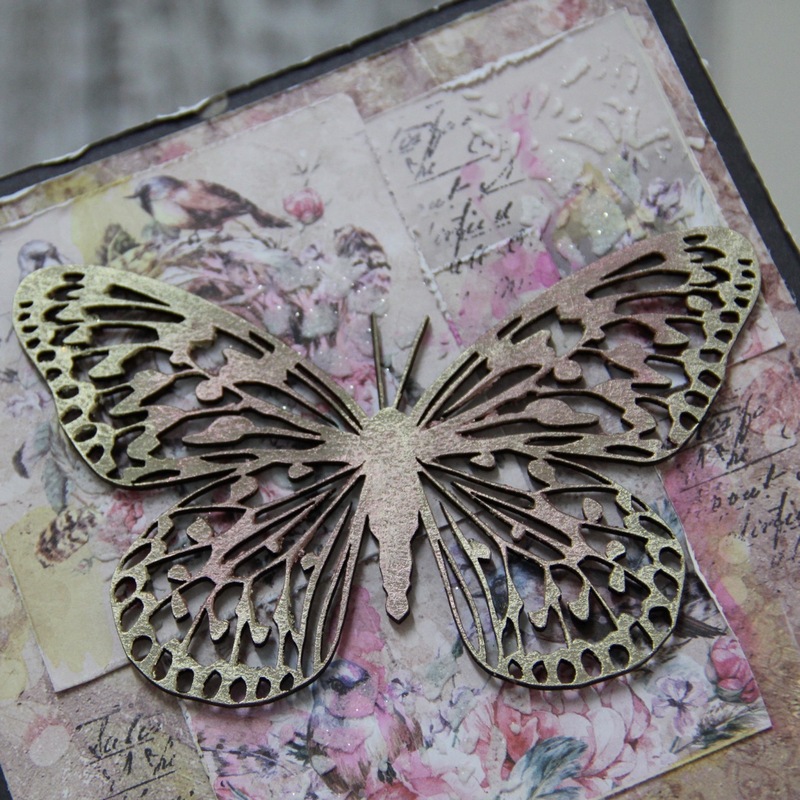 Painted background I dry embossed with 3D embossing folder. 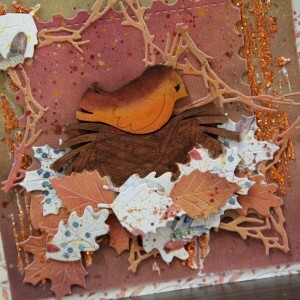 This entry was posted in Scrap FX and tagged Scrap FX. maybe you have sometimes the same problem, there is nice photo in stash and no good idea how to use it in layout. 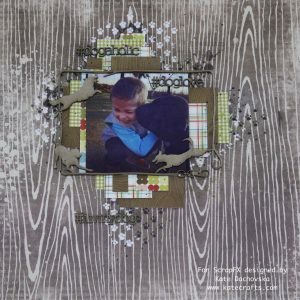 So that is story behindy my photo for todays layout – there is my son Toby and our older sharpei Caspian, three years ago, Caspi is so friendly lovely dog and he loves to kiss everybody and once I made this photo, Toby was back from small trip and Caspi was so happy that he is at home that he wanted to kiss him immediately. I think this is pure dogs love at my photo, I love it. 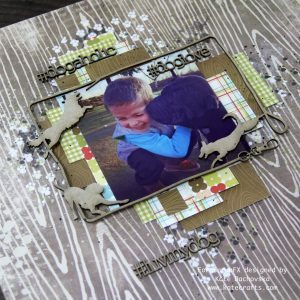 So awesome friendship can be between dog and small boy. It is easy mixed media background – I worked at 7 dots studio paper from very old collection, I made some background stamping, than I applied Paper texture paste over stencil with paws. 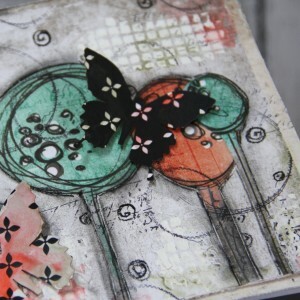 I applied Distress oxide Black soot also through the same stencil. Than I just cut different papers as cluster behind photo. I glued it and I glued chipboards and made some splatters. 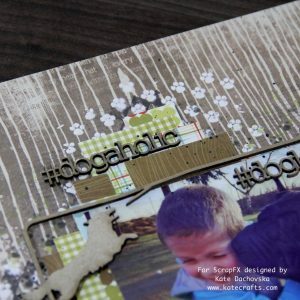 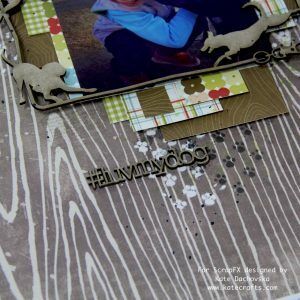 For layout you do not need any expensive embellishments just good idea, nice chipboards and that is all. I hope you will like it. 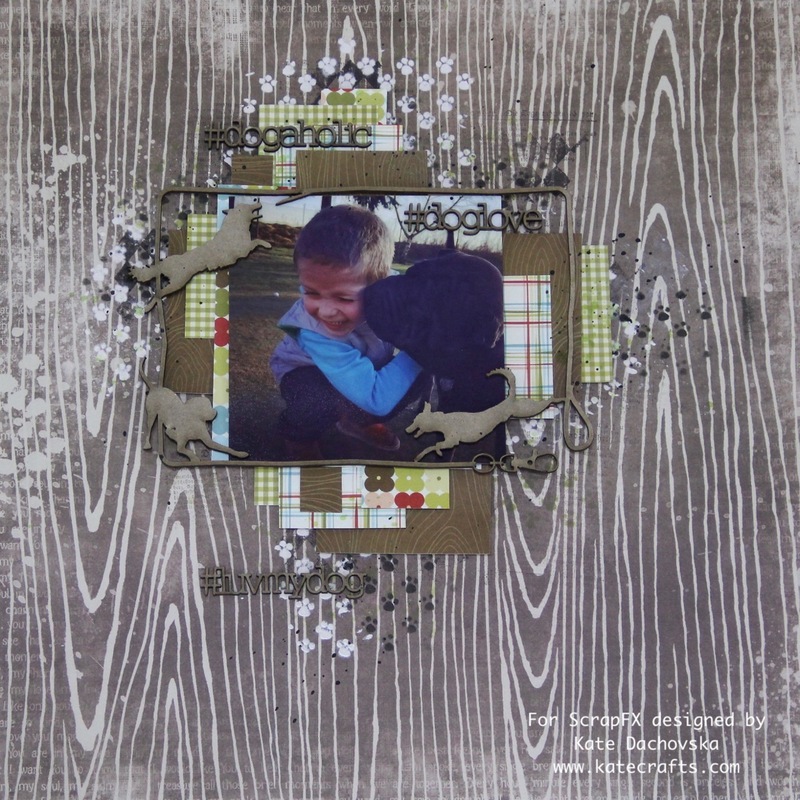 This entry was posted in Scrap FX and tagged layout, mixed media, Scrap FX. 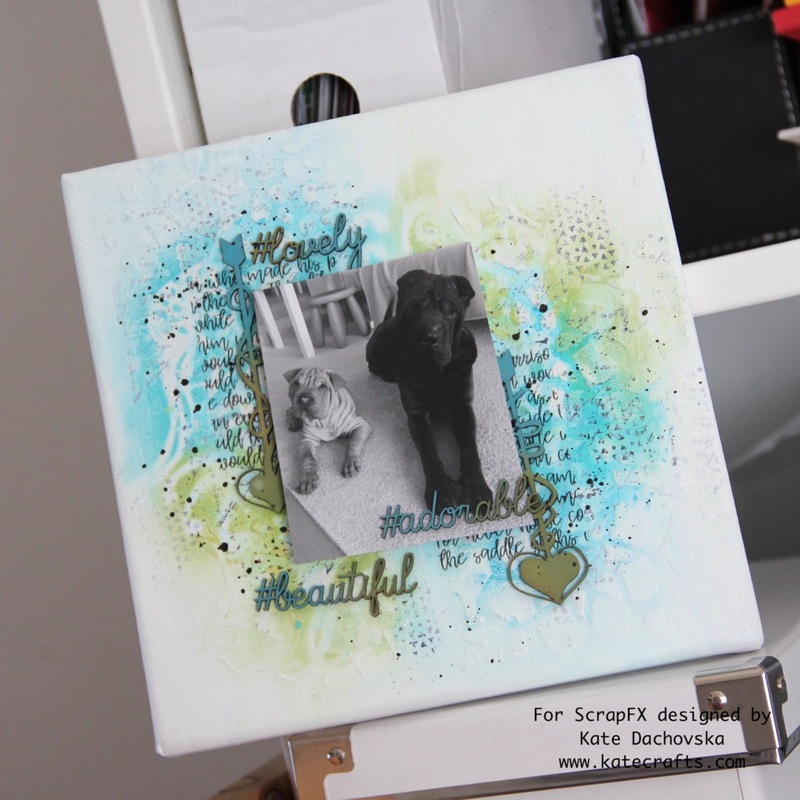 for today, I created a canvas with a photo of our 2 sharpeis. It is an older photo but I love it. 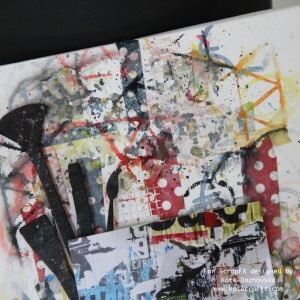 Canvas has got square shape. 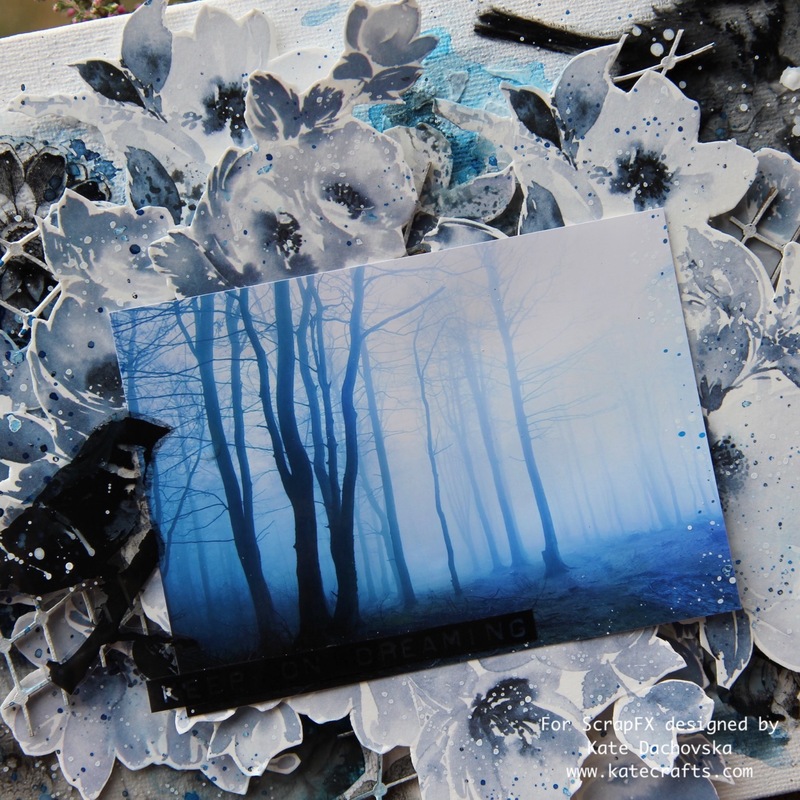 The first layer is white gesso, than I applied Plaster paste through stencil and Tattered Angels sprays, when I dried it, then I took stencil and Distress oxide inks and I applied them. 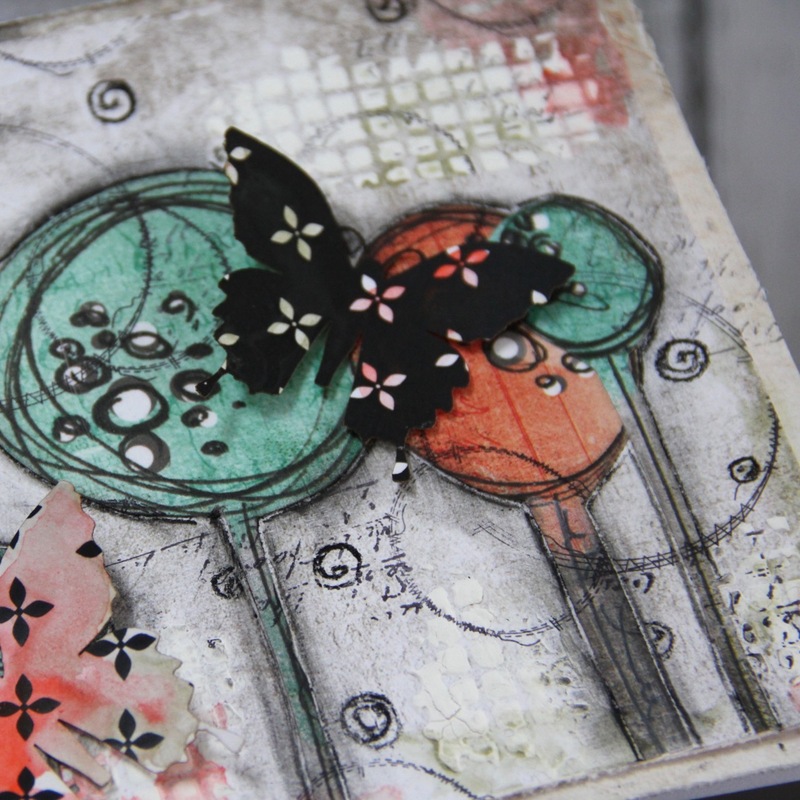 I made some stamping, some splatters and background was done. 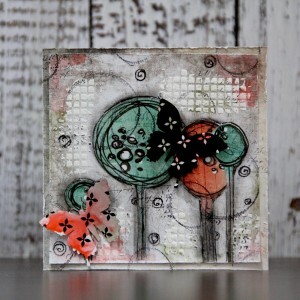 Behind photo there is nice transparency and chipboards which are coloured with Distress oxides. 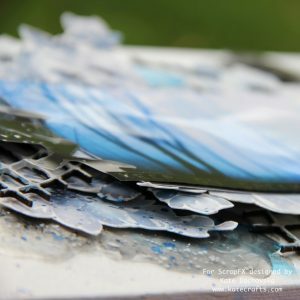 I think making quite simple canvas can be really fun.